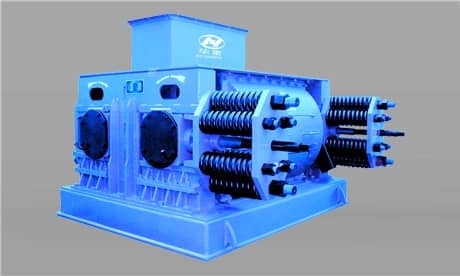 The three-roll crusher has compact structure, good sealing performance, low noise, reliable work and good effect, but its supporting facilities are more complicated and the structure is more complicated, so there are often faults in operation. ① The installation of residuals and the operation or maintenance of hard debris enter the crusher, causing the crushing roller jam and the outlet chute to discharge poorly or even block. ② The material has low granulation rate, high water content and high viscosity, which causes sticking, accumulation and material in the crusher and the outlet blocking material. ③ The operation is not familiar, the working conditions are unstable, and sometimes the weather is humid, the material has high water content and large particles, which causes overloading of the crusher and adhesion, accumulation and material in the crushing chamber and import and export blocking. ④ The gap between the scraper plate and the flat roller of the secondary crusher is too small. ⑤ The cleaning work is not timely, the number of times is not enough or not complete, so that there are many accumulations, knots and stocks in the crusher. ⑥ The V type triangular transmission belt is damaged. 2. The primary crushing effect is poor, and the secondary crushing effect meets the requirements. ② Hard debris enters the crusher, causing damage to the combing edge of the broken edge, part of the comb is interrupted, and the working gap becomes larger.